Google is testing a new feature that will change the way how you dig up phone specs over the web. The new search option hasn’t been made available to everyone as of yet. 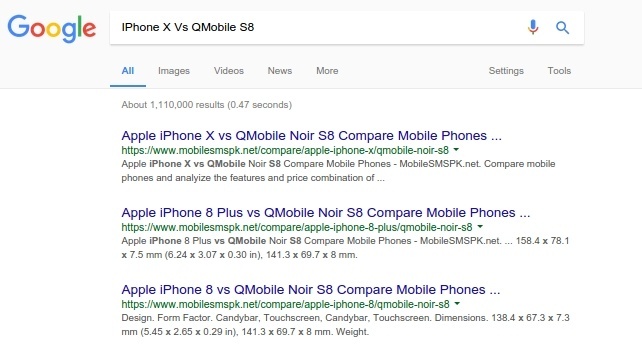 Once the update is rolled out to everyone, you will be able to see an overview of the comparison between the phones directly on the the Google Search page. To get the comparison table, you have to type the names of phones with “vs” between them. A dropdown arrow is also available for viewing more specifications. Currently, you can view the rows in which reviews, price, color, camera and some other features are compared. The smartphone version of the search gives you an option of highlighting the rows that differ. Currently only phones can be compared using the tool, other devices like laptops haven’t been included. Though the details aren’t as comprehensive as you would want them to be, it is a great tool to quickly compare multiple phones. It is a small but clever addition to the search engine. Expect these new features to be rolled out to Google app and web search in the coming weeks. bhai lagta ha sahe se parha nahe ha ap ne, unho ne kaha ha ke abhi ye sab ke leya nahe aye option. may be limited to specific countries right now for testing. Bhai isi liay kehtay hain k pehle article parh lia karo. Ghour se dekho zara last line.